This dish can also be made vegetarian-friendly if you substitute soyrizo for the chorizo. 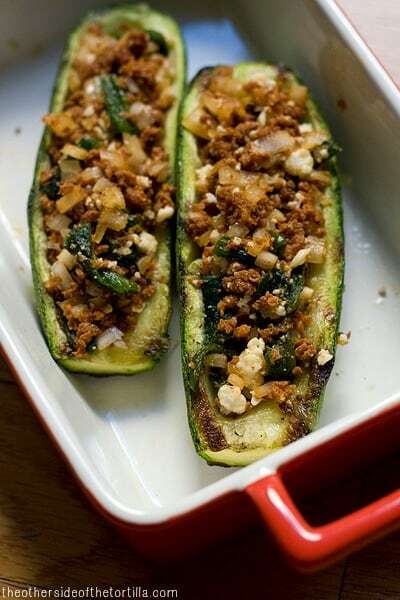 This stuffed Mexican squash recipe is an easy and healthy side dish with a smoky filling which can also be made into a vegetarian meal by substituting soy chorizo (AKA soyrizo). Cut the stem off the top of the calabacita. Grill them face-down over medium heat for 15 mins or until the middle is soft enough to dig out with a spoon. Let them cool a bit before you actually remove the middles. You'll just scoop them out to make a little boat for the filling to go. Blister and sweat the chilaca chiles like you would do with a poblano. You can do this by putting them on the grill and watching them carefully, turning until the skin blisters on all sides, or you can follow my tutorial on how to blister chiles on the stove. 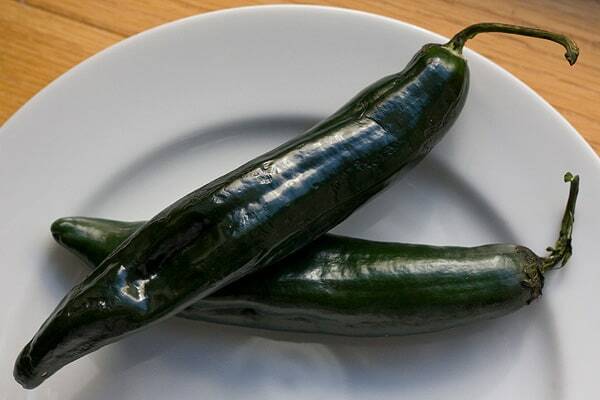 It's important to note that chilacas are much thinner-skinned than poblanos, so they will blister quicker. Place them in a plastic bag once they're blistered to allow them to sweat for 5-10 minutes or so. When they're done sweating, remove the skin and cut the top off of the chile. Cut a slit lengthwise and remove any seeds. Slice the chile into small, bite-sized strips. Dice a few slices of white onion until you have about six tablespoons. Mix with the chilaca chile strips. Cook the chorizo and drain the grease. Combine with the onion and chile and then crumble the queso fresco over the top. Stir to mix. Spoon into the calabacitas. If you're not going to serve them right away or if they are not warm by the time you get the filling in them, put the calabacitas in an oven-proof baking dish or serving tray and heat in the oven at 350 degrees F for about 5-7 minutes, depending how cool they are. Serve as appetizers or as a side dish with a main course; more queso fresco can be crumbled over the top if desired. How do you like your calabacitas? Yum yum yum…those look delicious. And for your husband to say “sabe a mi casa” is the best compliment! And now they taste like his home with you also. I am going to make these but I may need to use poblanos.